Can you guess where we went today? 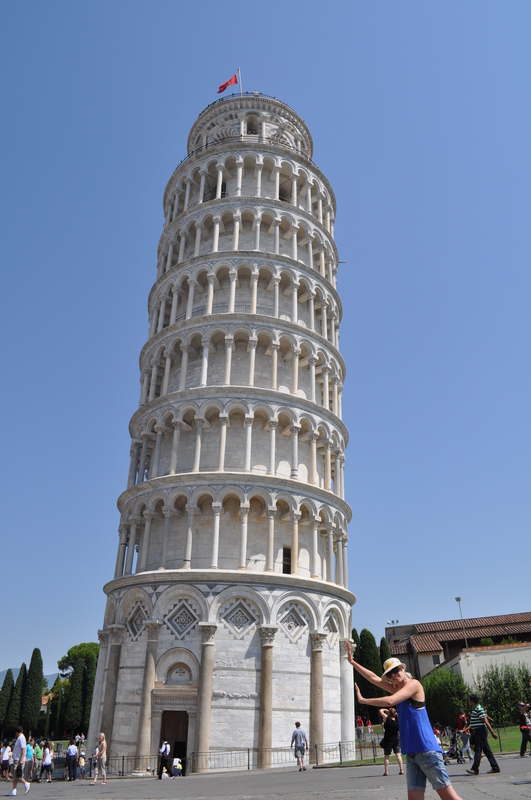 We took a drive to see the Leaning Tower of Pisa. We found some free parking about 3km from the Tower, it was nice to walk around and a chance to burn off some of the carbs we have been eating… well mummy and daddy need to burn off those carbs. It was another hot day, at least 40 degrees, we are tanning up nicely. It was a late start this morning so when we got to the Leaning Tower of Pisa, it was already lunch time. After a quick bite to eat, it was time to put on my best smiles for the Leaning Tower of Pisa photo’s. 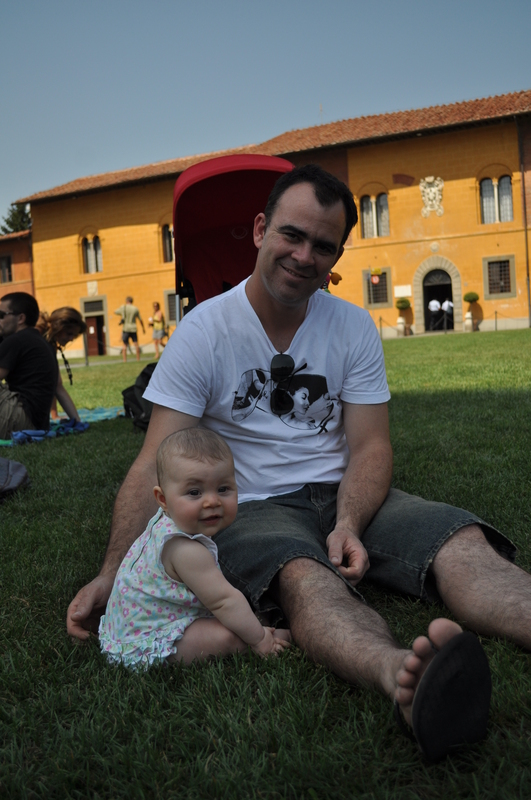 The Tower is in a park so we had a lay down in the grass, and I fell asleep while mummy and daddy took the standard Leaning Tower of Pisa photo’s. Mummy tried to get it straight. On the way back to the car mummy and daddy had a gelato. Mummy loves the Gelato, but I still haven’t tried it. I don’t know if it is a coincidence but they always seem to have it when I am asleep, so daddy can’t sneak me any. 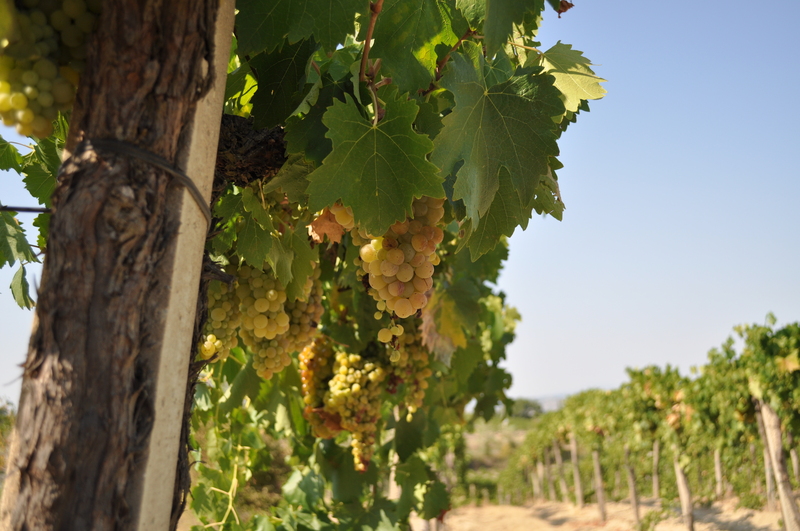 We drove the long way home so we could stop at a few nice places in the Wine country. 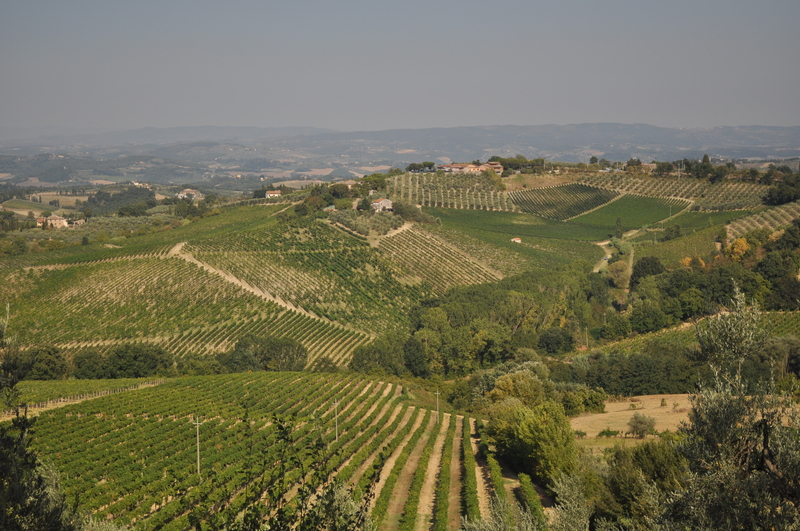 Tuscany is so beautiful, full of gorgeous vineyards and sunflower fields. 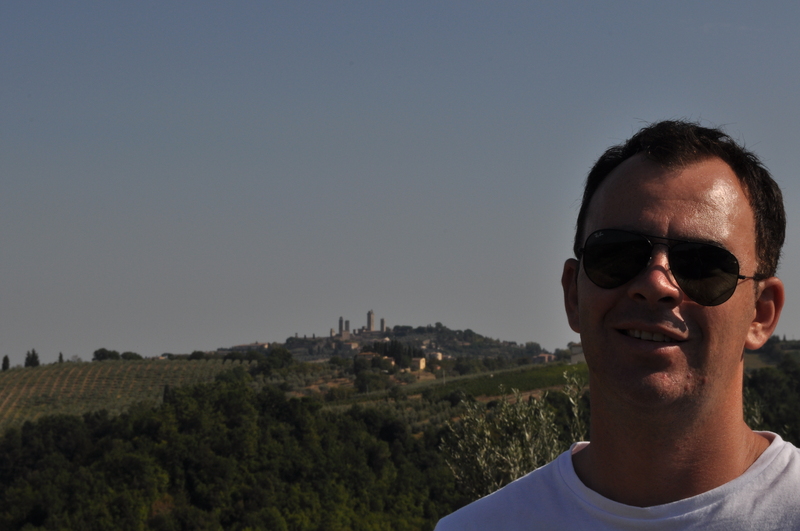 Our first stop was in San Gimignano, a pretty medieval walled city, famous for it’s towers. There was once 72 towers, but now there are only 14. It offers amazing panaormanic views of Tuscany and delicious wine shops, filled with homemade pasta sauces, pasta, salami’s and cheeses. Next stop was Siena and by this time the sun was beginning to set, so we stopped here for dinner. We found a gorgeous restaurant, tucked away in a little alley. It was a stone walled building at the base of a tower. Mummy had Steak with pears and traditional Tuscan white beans and daddy had Chicken with a berry sauce. I was being a little bit cheeky and wouldn’t go to sleep so mummy and daddy had to eat their dessert very quickly and take me back to the hotel for a sleep. It was another big day and for the most part I was very good. Tomorrow we are driving to Rome. Well you have travelled a lot in the last few Days.Your mum and Dad are showing you a lot off Italy. You are having a good Time I wish your Holiday could last a lot longer . 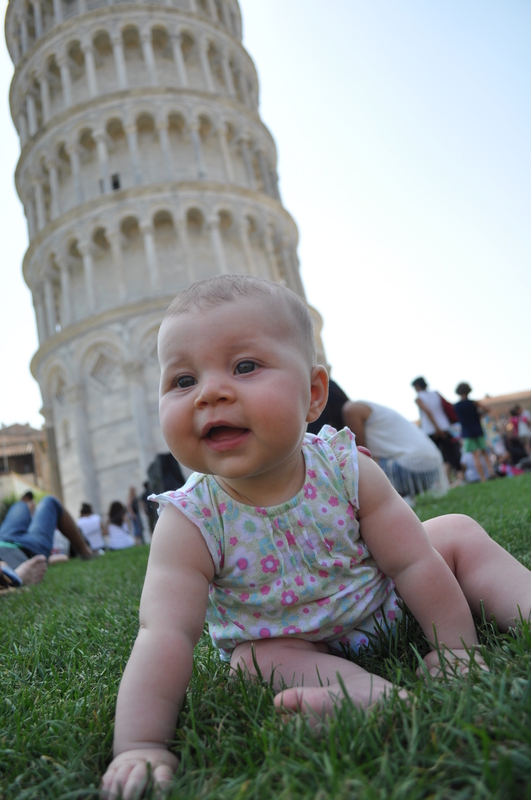 Opa and I have been to Pisa I have got nice memories .You all look like you are having a good Time love you all . We’re glad you are all having such a lovely time. 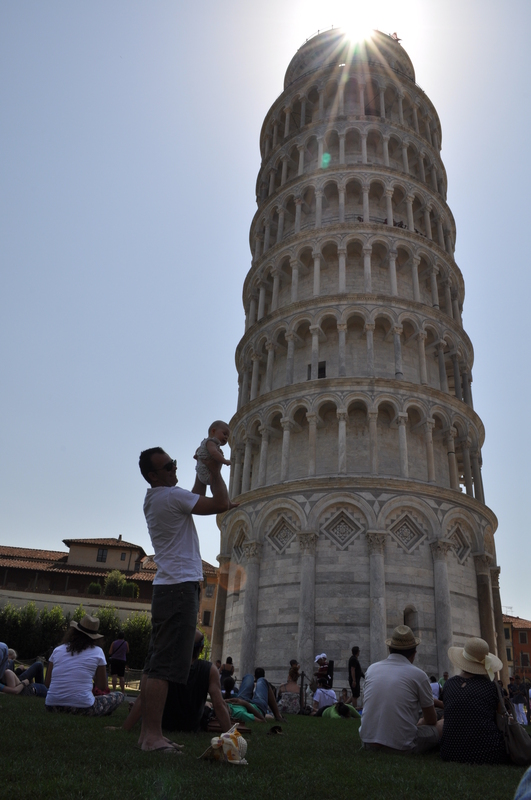 That was brave to climb the tower lucky your Daddy was holding you. Keep trying to sneak a taste of Gelato you might not like it at first especially if it is the lemon flavor but it sure will give your Mummy & Daddy a giggle. it looks very beautiful and inviting, I trust all of you guys are resting I know how hard it is for Big AL to sit. The last couple of days of our holiday we did do some r’n’r on the beach in Sorrento. It was lovely and I got to swim about in nice blue water. It would be great if you were to come over next year, we look forward to it. Say hi to Olivia and Katie.